In this article it explains how a group of people make a Robotic fish, to see what fish are like in the ocean. SoFi is a Robotic fish, and it can go near fish without disturbing them. Normally if a real human goes near a fish, the fish get scared and run away. SoFi is remote controlled fish. You can remote control her up to 50 feet. SoFi is able to determinant new fish secrets that we haven’t known for centuries. The fish even has a fin, that is flexible. One of the biggest problems with making SoFi was that they had to get a way for her to go underwater. SoFi is a free moving robotic fish, just like any other fish. She can get up close to other fish, and really interact with them. 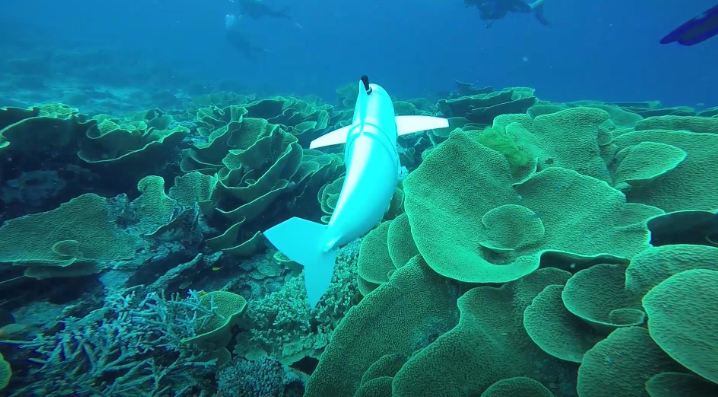 Robert Katzshmann says, ” To our knowledge, this is the first robotic fish that can swim untetherd in three dimensions for extended periods of time.” SoFi was tested in Fiji”s Rainbow Reef. It was a successful trail. SoFi is able to record videos of the under water world. She is a well made robotic fish. Rus says,” For us, this fish is magical.” SoFi stands for “Soft Robotic Fish.” SoFi was built by, MIT’s Computer Science. It was built by a smartphone battery. The coolest part is the remote control is a Nintendo Remote one. If you don’t know what a Nintendo Remote is, it is a video game controller. Personal Response: I chose this article because I thought that it was interesting that they made a remote control fish that could go underwater. I think that this matters because we are finding out so much from this robotic fish, that this information can help us save fish, and to protect their species. Go check out my flipgrid for more information! The remote control shark is very cool. You did a great job. That is amazing! This is a cool fish. I love SoFi. You chose a very cool article!